December 30, 2010 (San Diego) – Across the County, emergency crews are busy repairing roads and assessing other damage from the most recent storm. 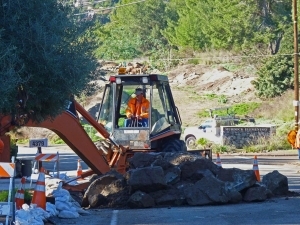 Following on the heels of last week’s heavy storms which saturated soils and overflowed numerous waterways, the most recent downpour caused additional rock and mudslides, undermined roads and caused potholes and sinkholes. On Conrad Drive, Mt. Helix, road crews are working today morning to repair a roadway undermined by the storm. In Normal Heights, a huge sink hole 12 feet wide by 18 feet deep forced evacuation of some area residents last night. On Mesquite Drive in the College area, a landslide occurred, while in Leucadia, a bluff collapsed, forcing evacuation of homes. In Ramona, the sewage treatment plant was inundated with wastewater. The County already sought disaster declaration after last week’s storms. Since then, the most recent storm dropped rainfall totals ranging from less than an inch in some San Diego County locations to over 1.8 inches on Palomar Mountain, the National Weather Service reports.